A new dawn in Renewable Energy India attains 4th position in global Renewable Energy Producing Countries. The Ministry of New and Renewable Energy (MNRE) has taken several steps to fructify Prime Minister Shri Narendra Modi's dream of clean energy. The largest renewable capacity expansion program in the world is being taken up by India. The government is aiming to increase share of clean energy through massive thrust in renewables. Core drivers for development and deployment of new and renewable energy in India have been Energy security, Electricity shortages, Energy Access, Climate change etc. In order to achieve the renewable energy target of 175 GW by the year 2022, the major programs / schemes on implementation of Solar Park, Solar Defense Scheme, Solar scheme for CPUs Solar PV power plants on Canal Bank and Canal Tops, Solar Pump, Solar Rooftop & Floating Solar Plants etc have been launched during the last two years. Various policy measures have been initiated and special steps taken in addition to providing financial support to various schemes being implemented by the Ministry of New and Renewable Energy (MNRE) for achieving the target of renewable energy capacity to 175 GW by the year 2022. These include, inter alia, suitable amendments to the Electricity Act and Tariff Policy for strong enforcement of Renewable Purchase Obligation (RPO) and for providing Renewable Generation Obligation (RGO); setting up of exclusive solar parks, development of power transmission network through Green Energy Corridor project; identification of large government complexes / buildings for rooftop projects; provision of roof top solar and 10 percent renewable energy as mandatory under Mission Statement and Guidelines for development of smart cities; amendments in building bye-laws for mandatory provision of roof top solar for new construction or higher Floor Area Ratio; infrastructure status for solar projects; raising tax free solar bonds; providing long tenor loans; making roof top solar as a part of housing loan by banks / NHB; incorporating measures in Integrated Power Development Scheme (IPDS) for encouraging distribution companies and making net-metering compulsory and raising funds from bilateral and international donors as also the Green Climate Fund to achieve the target. The increased use of indigenous renewable resources is expected to reduce India's dependence on expensive imported fossil fuels. India has an estimated renewable energy potential of about 900 GW from commercially exploitable sources viz. Wind - 102 GW (at 80 meter mast height); Small Hydro - 20 GW; Bio-energy - 25 GW; and 750 GW solar power, assuming 3% wasteland. A total of 7,518 MW of grid-connected power generation capacity from renewable energy sources has been added so far this year (April 2016 to March 2017) in the country. A total of 7060 MW of grid-connected power generation capacity from renewable energy sources like solar (3019 MW) and wind (3423 MW), Small Hydro Power (218 MW), Bio-Power (400 MW) has been added during 2015-16 in the country against target of 4,460 MW. During 2016-17, a total 3575 MW capacity has been added till 31.03.2017, making cumulative achievement 46,327 MW. Biggest ever solar power capacity addition of 3,019 MW in 2015-16 exceeding target by 116%. During 2016-17, a total 1750 MW capacity has been added till 31.03.2017, making cumulative achievement 9,235.54 MW. 31,472 Solar Pumps installed in 2015-16, higher than total number of pumps installed during last 24 years i.e. since beginning of the program in 1991. So far, 92305 Solar Pump have been installed in the Country as on 31.10.2016. Rs.38,000 crore Green Energy Corridor is being set up to ensure evacuation of Renewable Energy. Power Grid Corporation of India Limited (PGCIL) has sought a Loan assistance of US$ 1,000 million from the Asian Development Bank (ADB) comprising of Sovereign guaranteed loan of US$ 500 million and Non-Sovereign loan of US$ 500 million. the Loan would be utilized for funding of the following transmission projects including a project under Green Energy Corridor projects in next 3-4 years. Ministry's budget enhanced from Rs.1500 crore to Rs.9,000 crore (Rs.5,000 crore gross budgetary support + Rs.4,000 crore in way of bonds to be raised by IREDA) by 2016-17. Surya Mitra Scheme has been launched for creating 50,000 trained solar photovoltaic technicians by march 2020. A total number of 5492 Surya Mitra's have been trained as on 30.09.2016 and more than 3000 are undergoing training. A network of over 150 Institutions, spread all over the country, have been created for implementing Surya Mitra scheme. In addition, short term training programmes for small hydro, entrepreneurship development, operation & maintenance of solar energy devices and boiler operations in co-generation plants, have been organized. Shri Piyush Goyal, then Minister of State (IC) for Power, Coal and New & Renewable Energy launched “Surya Mitra” mobile App at National Workshop on Rooftop Solar Power on 07.06.2016. The GPS based mobile app has been developed by National Institute of Solar Energy (NISE) which is an autonomous institution of Ministry of New & Renewable Energy (MNRE). The Surya Mitra Mobile App is currently available in Google play store, which can be downloaded and used across India. This App is a high end technology platform which can handle thousands of calls simultaneously and can efficiently monitor all visits of Suryamitra's. The trained Suryamitra's who opts for entrepreneurship have joined in the Mobile App in several states. These Suryamitras are once again sensitized by NISE on soft skills Customer Relations Management, Punctuality and are now ready to deliver the services. Solar market too has become highly fragmented both product-wise as well as number of companies jumping into the Solar bandwagon. Vikram Solar completed 5MW in Tamilnadu in a record time. Vikram Solar has just completed 50MW in Tamilnadu in a record time. Vikram is working on the technology where by the DC to AC conversion can take place module level itself. These module have been successfully tested and are currently under going burn test at their own setups. 1500 Watt panel, which they say can be used as roof. 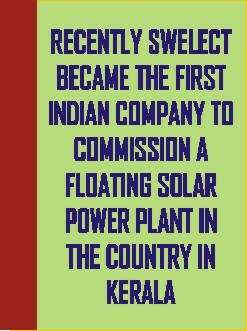 Swelect Energy Systems Ltd, formerly Numeric Power Systems Ltd, a BSE listed company sold of its UPS Business Unit for over 850 crores to concentrate on Renewable Energy, space. In just a few months the company has set up and commissioned two solar Power Plants and a Wind Power Plant and has over 2000 rooftop installations to its credit. The company has acquired HHV Solar, a reputed SPV Panel manufacturer and has invested heavily on increasing the plant capacity from 35Mw to 100Mw. Softdisk by its conservatives estimates, believes that 40 GW opportunity till 2020 is the most likely scenario. 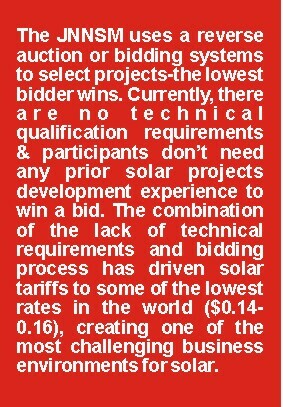 The Indian solar market is a key future growth market for PV. India's installed capacity as of quarter ending 31st March 2017 was 9.23 GW, which is still negligible as compared to more mature markets such as Germany. However, the first two quarters of 2017 alone have seen additions of 643.57 MW to Indian PV installed capacity, more projects are under completion. 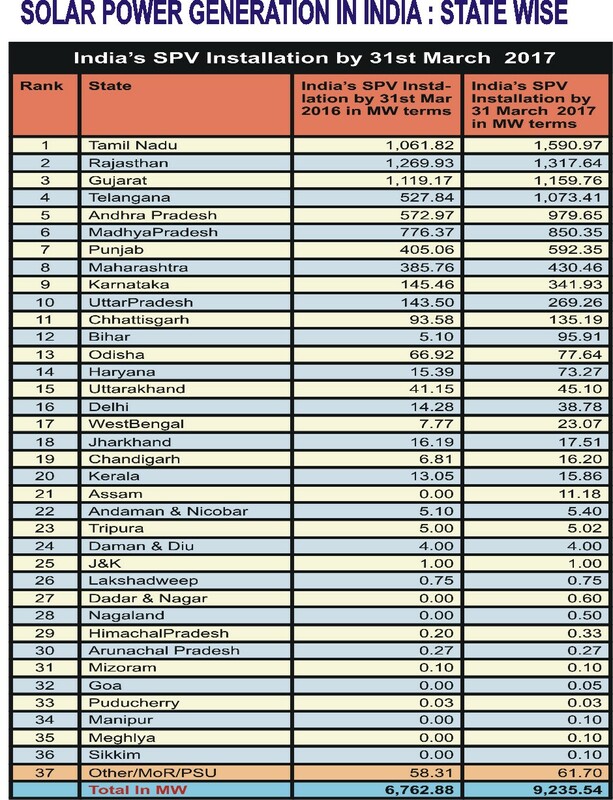 According to Softdisk report in Solar PV Power Generation, Tamilnadu as on 31st March 2016, with a total installed capacity of 1590.97 MW has become the state with largest installed capacity. There are also external factors in India challenging its solar industry, namely high inflation and consequently high interest rates, slowdown in GDP growth, a several depreciated rupee and relentless corruption scandals of the previous Govt. Low bids with high interest rates in the range of 13 to 15 per cent make it challenging to borrow in India. Most Indian Banks look at these projects as risky and look into it only after land acquisition and registration & PPA. Statutory approval are completed & the number of successfully executed quality project that can last 25 years.